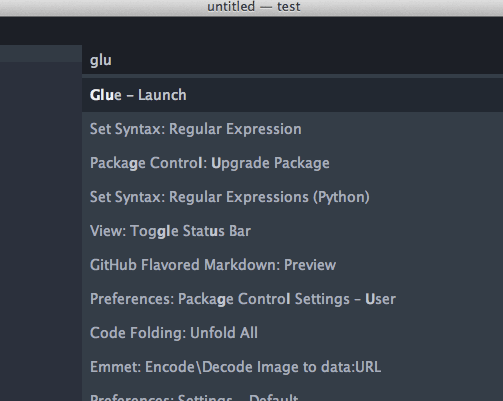 Type ‘install’, select the menu item, Package Control: Install Package, then type ‘glue’. The selection for the Glue plugin will appear. Select it and the install is performed automatically. $ git clone https://github.com/chrissimpkins/glue.git "Glue"
If you like to do things the good ole’ fashion way, download the source repository from GitHub (tar.gz | zip). Decompress the source repository and rename it “Glue”. Open your Sublime Text Packages directory using the Preferences -> Browse Packages menu items. 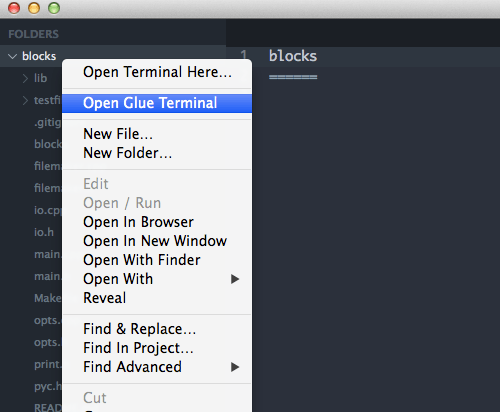 Move the entire Glue directory into your Sublime Text Packages directory. Glue assigns a default user PATH from your environment PATH variable. Frequently, it nails it, but on some installs it may require a bit of help. Never fear. It is incredibly simple to correct this issue. in the text input box at the bottom of your editor. This displays the default PATH that Glue uses to identify your executable files. If the PATH is incorrect, or if you simply want to modify your PATH in Glue, follow the instructions below. Include your shell PATH settings as a colon (Mac OSX/Linux) or semicolon (Windows) delimited string. Linux/Mac OSX users can find this by entering echo $SHELL in the terminal. Save the file and restart Sublime Text. Glue respects your assignment of directory priority in the standard left to right sequence as it attempts to locate system executables for the commands that you submit. If you find that a different version of an executable is being launched, or that installed applications are not being located, please confirm your PATH string in the Glue settings. Use the Glue Settings - User settings file rather than the default file. The default settings are overwritten on Glue updates! You have the option to assign your default shell in the glue_shellpath setting. Open the Glue Settings - User JSON file and add a new line to it that includes the setting key with the value set to the path to your desired shell. Then begin entering your commands in the command line at the bottom of the editor. Use the same syntax that you use on the command line in your terminal (with special character escapes or quotes! ).